British Columbia immigration has held its biggest draw so far in the year 2019, announcing invitations to apply to 356 international graduate and skilled worker candidates. The Jan 30 draw was the BC province’s 05th of the month, with invitations announced over 05 streams. Least scores continued constant, with direct Express Entry and provincial and categories for skilled workers needing 85 points. Direct Express Entry and provincial categories for international graduates needed 95 points, while semi-skilled and entry-level applicants required 68 points to qualify. British Columbia’s earlier draw held on Jan 23 and was focused at IT professions by the Tech Pilot of BC PNP. 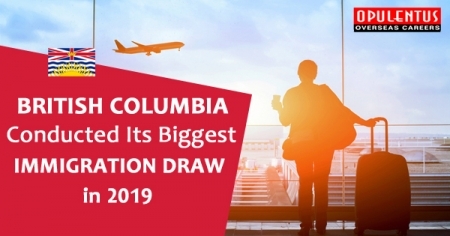 The draw viewed 45 invitations announced for British Columbia immigration, over 05 provincial streams. For skilled workers by both the direct Express Entry and provincial streams, there was a least score of 85 points. For both direct Express Entry and provincial international graduates, the least score required was 95 points. For semi-skilled and Entry-level workers the minimum needed was 68 points. The Tech Pilot of BC PNP has been extended into the year 2019 after its first launch in the year 2017. It currently has a 29 target professions list with comfortable duration requirements. British Columbia P.N.P draws explicitly concentrated on technology workers commenced in May 2017. The province of B.C has a prolific technology industry with some great names of the tech world basing themselves in the western province of Canada.